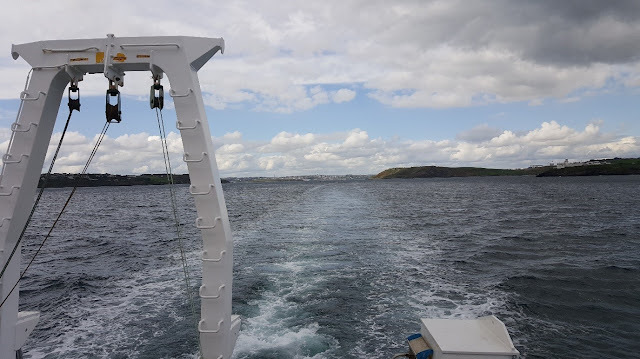 I am travelling on board the RV Celtic Voyager as a member of the Marine Institute INFOMAR survey team. 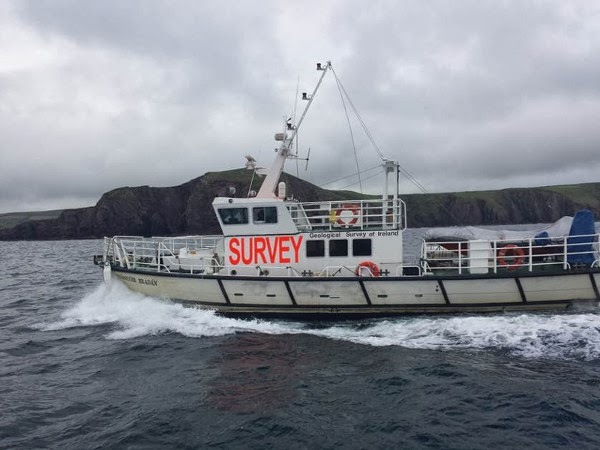 This seabed mapping survey expands on previous surveys in an effort to create a range of integrated mapping products for Ireland. My role will be as an online surveyor. This involves operating the survey systems on a 12 hour shift rotation. We will have 24 hour operations on board to maximise our efforts for our ship time. Leaving the Cork city on the 24th of April 2017 our destination is approximately 45 nautical miles east of Cork Harbour, about 25 nautical miles south of the Waterford Coastline. Our efforts will last one week depending on weather conditions which are rough and building as I write this blog. This trip is a special one for me as it is my first with the Marine Institute and my first time on board the RV Celtic Voyager. Upon arriving at the vessel docked on the Cork quays I was welcomed on board by the captain and shown around the vessel. There is a crew of 11 on board which includes 7 crew and 4 scientists. The Vessel consists of three floors with the wheelhouse and dry lab on the top floor. I will be mostly working in the dry lab where our surveying computers are setup. The middle floor contains the mess which includes a canteen and lounge, and wet lab which is where all the wet and dirty work goes on with access to the working deck at the stern of the vessel. The bottom floor is where the crew cabins and washing facilities are located. My cabin is more spacious than I expected with bunk beds, a sink, wardrobe, TV and small bench. I’m sharing my cabin with another scientist who will work on an opposite 12 hour shift to me. This is to insure there are no disruptions during our sleeping hours. Being the newest scientist on board, I have inevitably got the night shift working from 12 midnight to 12 noon. Right now we are in transit to the survey area which will take about six hours. I am looking forward to getting surveying and seeing what the weather has in store for us. My plan for the evening are to have dinner at 1800 and get some sleep before starting my shift tonight. Natural Methane Degassing, Mud Volcanoes And Chemosynthetic Life; Exploring A Complex Environment In The Gulf of Cadiz, Southern Iberian Peninsula. 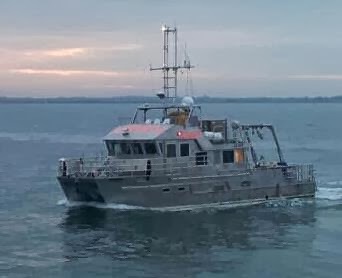 Ireland's largest survey vessel the RV Celtic Explorer has taken a full complement of Irish and international scientists to survey unique seascapes and habitats where the Mediterranean waters spill into the Atlantic sea at the Gulf of Cadiz, south of Spain. The research cruise called DEEP-LINKS, under the guidance of lead scientist Dr. Jens Carlsson from University College Dublin’s genetics lab, includes twelve scientists from five Irish and four international marine research institutes. 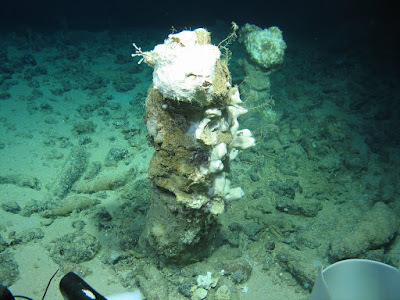 DEEP-LINKS got its name from the mission’s research objective: to explore mud volcano sites in order to classify their unique ecosystem that thrives without sunlight, and define how this ecosystem is linked to deep sea fauna such as corals, sponges and fish. All hands have been on deck! 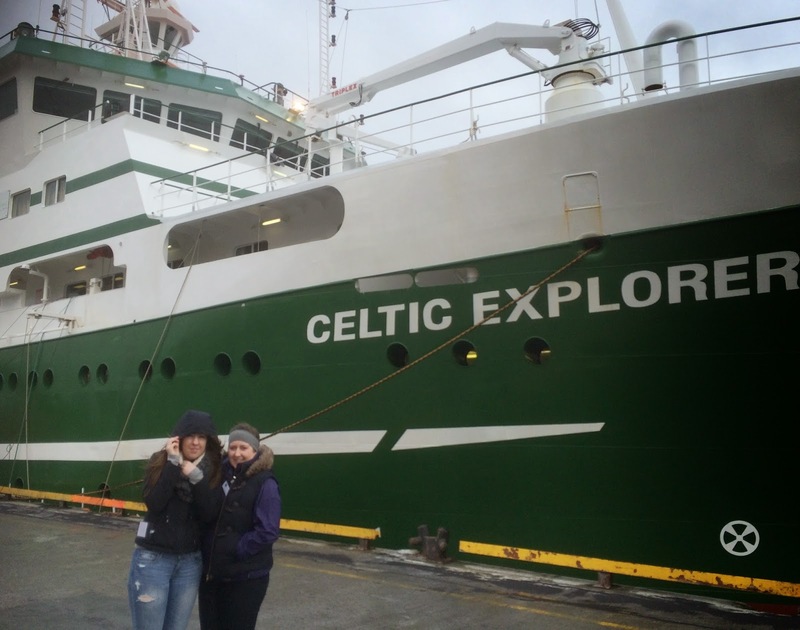 On-board the Celtic Explorer life has been hectic for the ship’s crew, the ROV team and the scientists since the vessel departed Galway on Oct 23rd. With unified focus on the task at hand, the mission has succeeded in completing all tasks and has exceeded expectation! The team aboard have successful mapped four target locations using the new RV Celtic Explorer’s high resolution multibeam echosounder. The resulting maps have been used by the geologists to interpret the environment and geological events at each location; these interpretations provide an essential component when establishing target locations for the biologists to visually survey and sample each location's ecosystem, using the Marine Institutes Holland I Remotely Operated Vehicle (ROV). 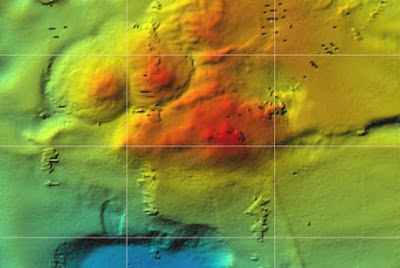 Site 1: Multibeam image of the Hesperides mud volcano, Gulf of Cadiz. Hesperides is a complex structure of three mounds, ~200m high, 2 km x 4km in size and with east-west oriented ridges extending to the east. Geologically unique, in that these volcanoes extrude mud and methane as opposed to magma; they form when mud buried deep within the stratigraphic column becomes subject to pressure from the Earths tectonic plates and follows a path of escape to the seabed. In the Gulf of Cadiz, pressure caused by the northward movement of the African plate with respect to the Eurasian plate has resulted in diaperic upwelling of mobile sediment through fractures in the rock above, to result in the formation of a series of mud volcanoes. Along with mobile sediment, methane and hydrogen sulphide gas seep from several kilometres beneath the seafloor. This degassing is particularly interesting to the biologists on-board, as microorganisms that acquire their energy from methane and hydrogen sulphide, in a process known as chemosynthesis, thrive here. 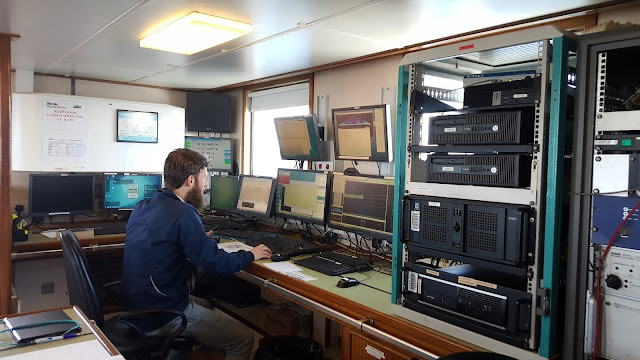 Following the survey, further research will be carried out on the 300+ samples collected during the survey, to establish the ‘deep links’ between microorganisms and the deep sea fauna endemic to this area. It is hoped we will be able to establish how chemosynthetic energy is dispersed through the non-chemosynthetic deep sea life such as corals, sponges, deep-water crustaceans and fish, so we can assess the importance of chemosynthetic derived energy to the wider ecosystem. 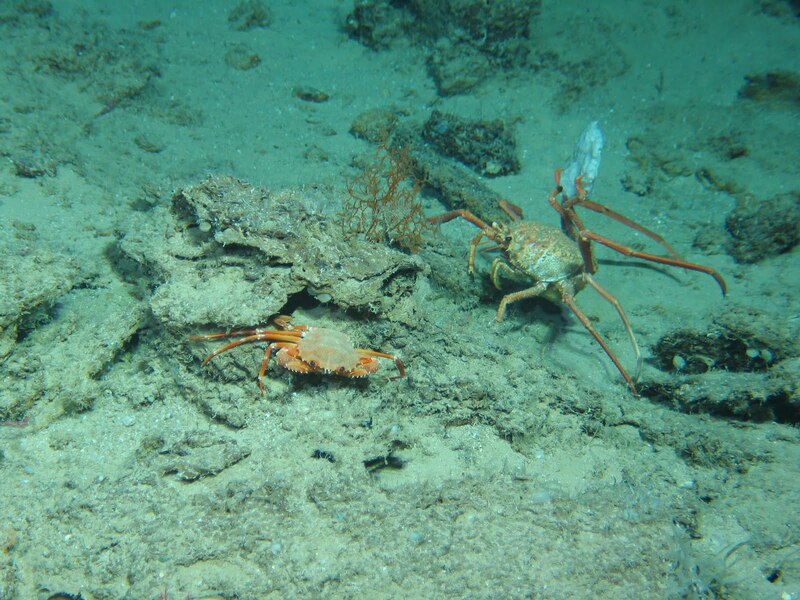 Photograph of some coral and two species of crab (including a sponge wielding crab! ), just some of the deep sea fauna we have sampled, that could be influences by the chemosynthetic ecosystem. Most of life we are used to on earth derives its life energy from photosynthesis, some microorganisms thriving in deep dark environments, such as in the Gulf of Cadiz, are often thought of as usual because their life energy is derived from deep within the Earth. But chemosynthetic life is far from unusual, chemosynthetic populations continue to be found as we continue to explore the deep oceans. Many scientists now believe energy from within the Earth could have been the initial trigger for life on Earth, billions of years ago. Similar microorganisms are now also targeted by space missions on the hunt for life in space. The picture to the left is a multibeam image of Anastasia, the second site we mapped and surveyed with the ROV. It is a perfect cone volcano 3km wide, with deep motes to north and south west. The pictures to the right show some of the team (myself included) working away in the ROV shack, a dense growth of large deep see corals and some of the sample preparation that happens back on board in the wet lab. Geologists have also established a link with chemosynthetic life and a geological process that results in the formation of carbonate chimneys at mud volcanoes. During the ROV survey of the volcanoes, the geologists on board began to notice carbonate chimneys up to 1m in length occasionally scattered in areas on the volcanoes flanks, elongated down slope. Further investigation resulted in the discovery of a forest of upright carbonate chimneys, each up to 2m tall and 50cm in diameter, embedded in the mud at the summit of an active site at Hesperides mud volcano. The summit of the volcano is also where we see bacterial mats and methane gas actively bubbling from the surface of the youngest mud flows. 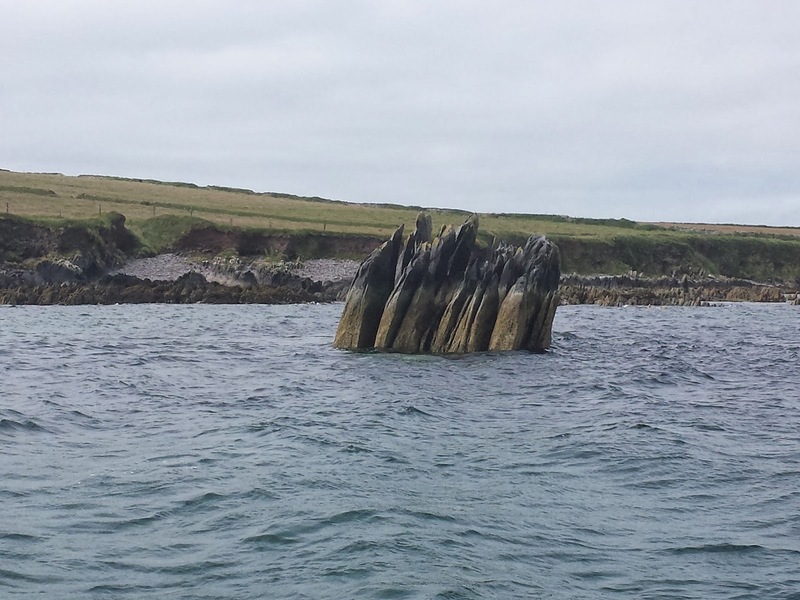 The origin of these carbonate chimneys is thought to be a result of methane and hydrogen sulphide degassing and its interaction with bacteria and seawater. Bacteria live off the methane and increase the alkalinity of the sediment pore fluids. This results in: anaerobically oxidisation of the methane to bicarbonate and the transformation of the sulphate to sulphide, which in turn reacts with calcium ions in the seawater to produce the precipitation of carbonate and the generation of hydrogen sulphide. Lead team geologist Dr Bramley Murton proposes that these carbonate chimneys grow as cylindrical structures around the methane streams, both in the sediment and in the water column immediately above the seafloor at the summit of the mud volcano, where methane flow is focused. These chimneys are then pushed down slope after being incorporated into subsequent eruptions of mud and gas on the summit as the mud volcano edifice grows, which explains why the fallen chimneys are found on the volcano flanks. The abundance of carbonate chimneys found at Hesperides mud volcano show that there has been a long history of intense methane gas escape and mud eruptions that support chemosynthetic life here. It appears as though this site has been active for many thousands of years! Extinct chimneys up to 2km in height litter the summit of a dormant mud volcano, in the Gulf of Cadiz. Sediment temperature and core samples were taken with instrumentation attached to the ROV, where active degassing and thick white fluffy microbial mats occupy the seabed. These samples will be analysed to establish gas composition and temperature flow that will in turn assist with further geological characterisation. Physical samples of the chimneys will be analysed to establish a robust understanding of their formation and development. Gravity cores were attempted by launching a 3m long tube over the side of the vessel, so sediment profiles at the summit of volcanoes could be analysed and compared to cores taken in the moats on the flanks of the volcanos. We target the deep moat areas to profile historical records of mudflows. While it was evident the Gravity corer penetrated the sediment fully, sadly no complete records were retrieved. A set of samples up to 1m were achieved and will be studied at the National Oceanography Centre, UK. The photograph on the top left shows the ROV’s arm taking a core sample beside white microbial mats and degassing. The photograph to the top right shoes Dr. Bramley Murton (NOC) taking fluid samples, each cm along the core for further analysis. Above is a photograph of the geochemist on-board Dr. Kate Peel (NOC) and I taking samples of each cm of the core. 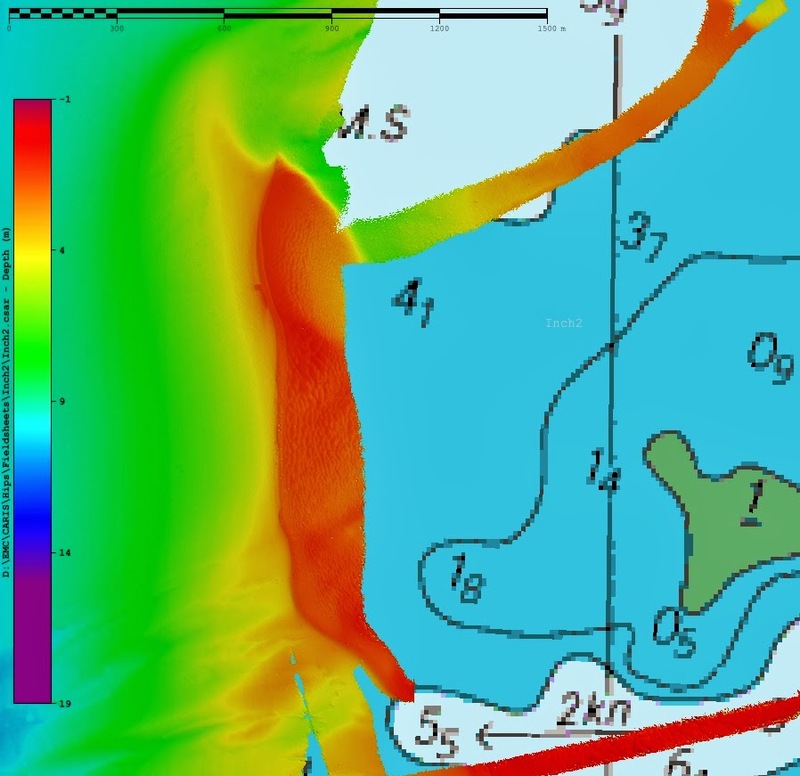 During the initial mapping, measurements of seawater chemistry recorded during sound velocity profiles (SVP), essential for multibeam mapping, were noticed to be producing interesting deviations. Subsequent data were captured to profile the conductivity, temperature and density (CTD) of the 1.2Km water column that concurred with what we were seeing in the SVP data. At many sites, strong warm saline currents were flowing east to west. We believe these currents represent Mediterranean seawater flowing out into the Atlantic and comprise a deep dense layer, without mixing with Atlantic seawater above. Our observations concur with previous studies that indicate a layer of Mediterranean seawater can be traced as far out into the Atlantic as the Mid-Atlantic Ridge. Unequivocal evidence in the geological record shows the Mediterranean was once closed off to the Atlantic; the DEEP-LINKS team are now interested in mapping historic and present day interaction of seawater and the sediments and life it transports between both seas. 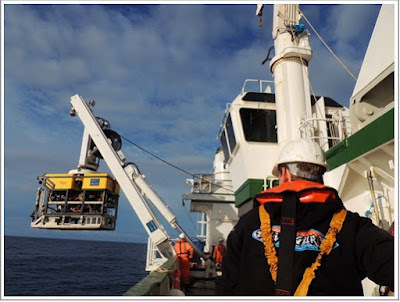 Further scrutiny of the high-resolution sonar mapping, ROV footage, physical rock and biological samples will enrich Irish marine scientific research and international collaborations designed to understand the secrets hidden within the darkness of this complex deep-sea environment. Exciting and progressive research will include: the identification and description of new species, genetic studies of the chemosynthetic ecosystem and its links with deep-sea fauna, the characterisation of degassing and fluid rock interaction at mud volcanoes. Societal benefits will include interrogation of biological samples for potential drug development, aimed at detecting chemicals that may be useful in the treatment of infectious and invasive diseases. This type of multidisciplinary study is critical to our holistic understanding of the ocean. Here we see how tectonic movement, instigated deep within the earth, influences seabed morphology and degassing processes, that in turn host chemosynthetic organisms which feed mobile deep sea life. The RV Celtic Explorer returned to Galway on the 12th November with a full complement, comprising crew, ROV pilots and scientists. The team thank the vessels crew for all their help and support over the duration of the survey. DEEP-LINKS was supported by the Marine Institute ship time grant under the National Development Plan. Some of the team look tense in the ROV shack; where the ROV is operated by the pilots and live feeds of the footage is interpreted by the scientist. 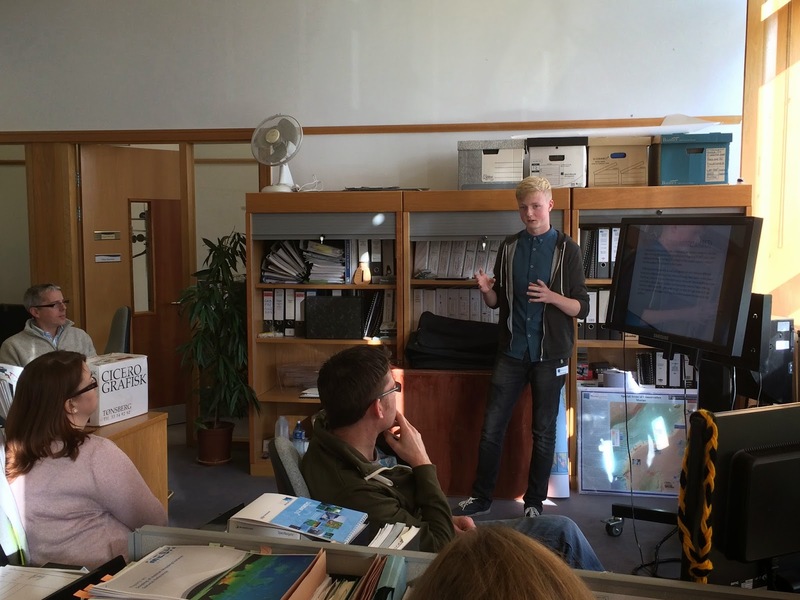 Jack Lillis, Aoife Muldoon and Emily Egan recently completed transition year placements hosted by INFOMAR at the Marine Institute. All of the students spent a week visiting the various Marine Institute facilities and learning about the different activities within the Institute. At the end of their experience, each student created a ‘story map’ and power point presentation to illustrate what was achieved during their placements. “We really enjoyed our week at the Marine Institute and we now know a lot more about what a career in Marine Science really means. It’s a hugely interesting area of science that we don’t learn about in school. We especially enjoyed our visit to the Celtic Explorer, seeing the multibeam system, learning about seabed mapping and how this information improves the admiralty charts so that vessels like the Celtic Explorer can safely visit ports. We also learnt about how seabed mapping relates to the fishing industry and helps sectors like Ocean Energy, this was of particular interest to us. Britice-Chrono NERC Consortium. Cruise 1: Our looking glass onto the sea-floor…..
Fabio Sacchetti and Vera Quinlan represented INFOMAR at the CARIS 2014, 'Developing the Blue Economy', user group conference. 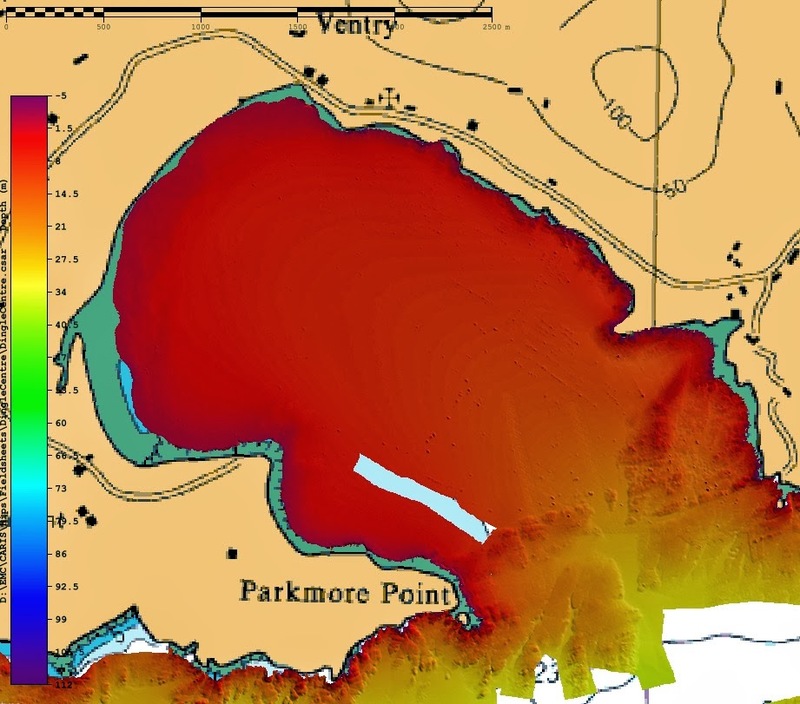 Caris is one of the largest developers of hydrographic software solutions and it is used by most of the hydrographic organisations around the world. The conference was held in Brest, one of Europe's main centres of marine science and technology and recognised as a centre of excellence in marine research, education and hydrography. The main theme of the conference focused around our oceans and seas, one of Earth's most valuable natural resources and major contributors to the world economy. Over 90 per cent of global trade is transported by sea and a wealth of resources can be found within its depths including food, minerals and energy. The health of our oceans and seas is critical in developing economic sustainability, yet our oceans still remain largely unexplored. Hydrography plays a significant role in sustaining our oceans, underpinning an ever-increasing list of activities which include coastal zone management, marine spatial planning, ocean science, offshore energy, environmental monitoring, tourism and many more. 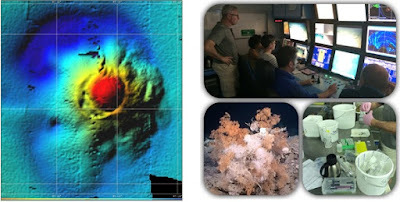 Over the years, INFOMAR has developed a world-leading reputation in seabed mapping including methodologies, human capacity, know-how and physical infrastructure. Within this context, it was crucial for INFOMAR to have a strong presence at the Caris event in order to share experiences, talk with industry leaders, drive the direction of future software development and hear about the latest technological advancements. Over two hundred delegates from European and US hydrographic offices, academic and research institutions attended. INFOMAR delegates Fabio Sacchetti and Vera Quinlan manned a stand detailing the seabed mapping that is ongoing within the program and fielded many questions on how we have managed such a successful campaign. Fabio presented a talk 'INFOMAR - A foundation for Harnessing our Ocean Wealth'. In addition, Fabio also presented two research posters focused on glacial geomorphologies of the Irish seabed and sediment mobility on the coast of Northern Ireland derived from INFOMAR surveys. Preceding the main event, two days were spent sharing ideas and concepts. Future software enhancements were discussed, argued and agreed upon through both the user group meetings and boot camps hosted by CARIS. Many valuable contacts were made which were mutually beneficial both to INFOMAR and the hydrographic, academic and research institutions involved in seabed mapping worldwide. INFOMAR supports academic research in Irish water. Over the last 2 weeks, INFOMAR provided support for the WICPro survey project on board the R.V. Celtic Explorer. The survey, led by Prof. Andy Wheeler, represents a coming together of several Irish university research groups and international collaborators. Dr. Fabio Sacchetti from the INFOMAR team was on board as co-investigator and to support geophysical and sediment sampling activities. 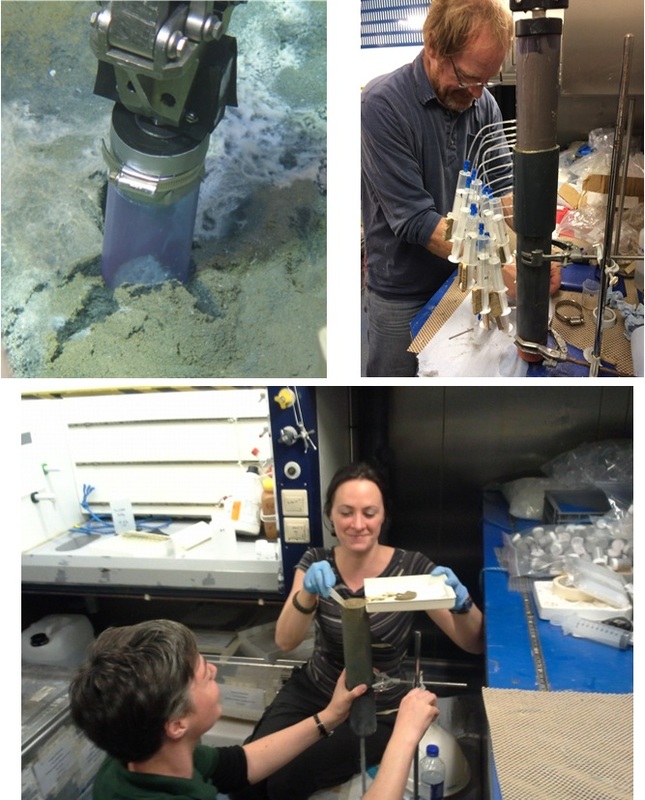 The survey focused on the collection of sediment core material and geophysical data from several survey areas in support of different research objectives. Objective 1: Study of environmental records from cold-water coral reefs on the Moira Mounds. The aim is to test hypotheses relating to cold-water coral reef initiation and development and sedimentological dynamics in a zone of active coral growth in the eastern Porcupine Seabight. Objective 2: Study the history of glaciomarine deposition from the Porcupine Bank flank. 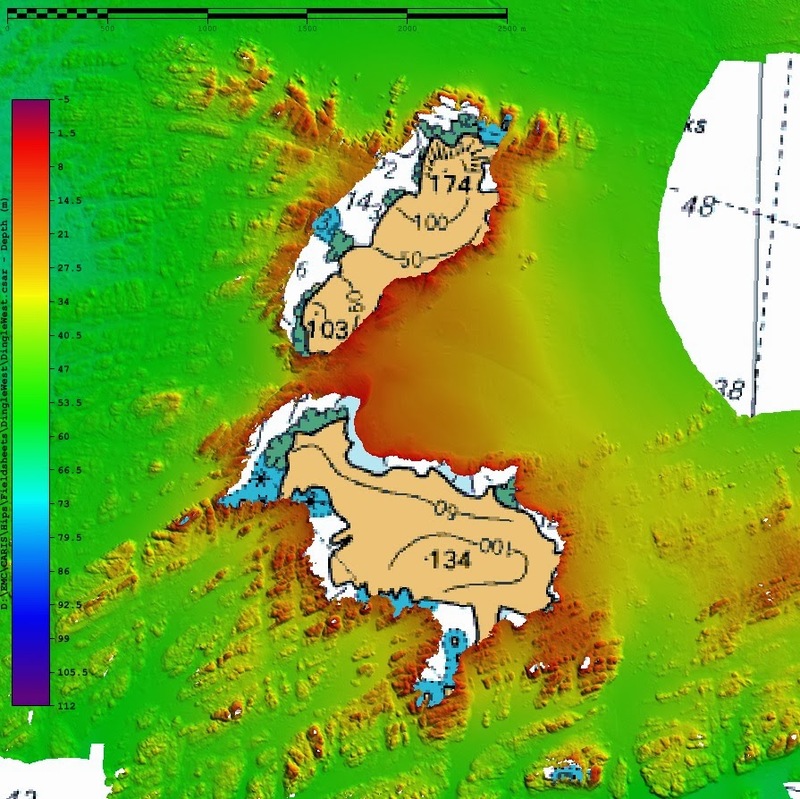 The study will focus on the effect of glaciation on the development of the outer western Porcupine Bank, to explore evidence for sea ice extent, pro-glacial sediment supply and ocean circulation changes. Objective 3: Study the ice limits and glacial processes on the western shelf. 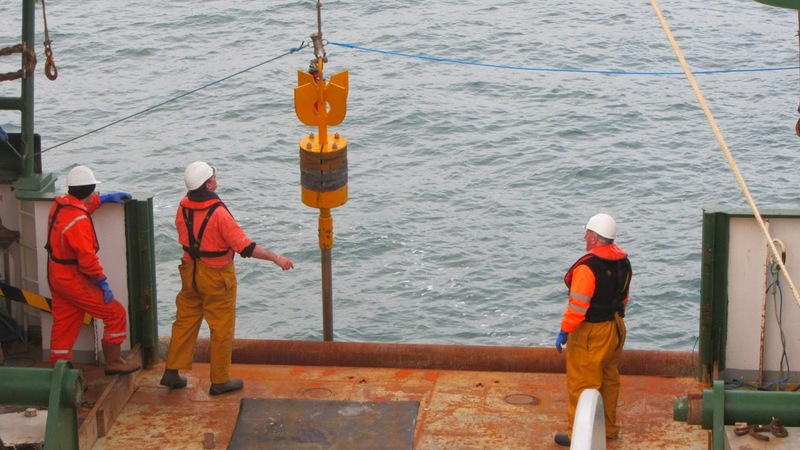 The primary aim is to use seismic data to define ideal sites for coring during the BRITICE-CHRONO programme on the RSS James Cook later on in 2014. Additionally, Irish sediment cores/sparker data will help to determine the nature of glaciation on the shelf edge and will be used to date some of the glacial moraines present on the continental shelf. The survey was also a good opportunity to test the sediment sampling capabilities of the R.V. Celtic Explorer and in particular the performance of the recently acquired 6 m gravity corer. Fig. 1 shows the new 6 m gravity corer being prepared for deployment. The red cylinder connected to the top of the corer is the USBL acoustic beacon used to monitor the position and depth of the corer during its descent. On-mound and off-mound cores were retrieved from the Moira Mounds in the eastern Porcupine Seabight. 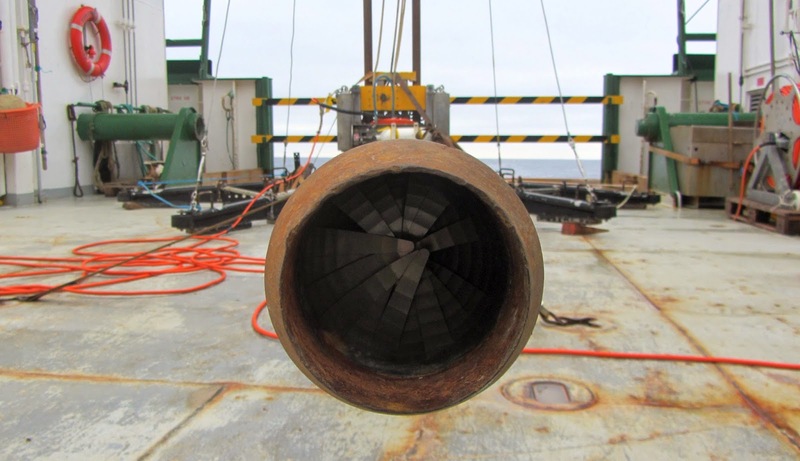 Cores were retrieved from the Porcupine Bank margin targeting glacial sequences down to 3000m water depth. Also on the Porcupine Bank, a small number of box cores and a gravity core were taken from the canyons mounds (both on- and off-mound). Fig. 2 shows the box-corer been deployed and some of the seabed fauna found inside the sediment sample. Considerable effort was made to collect geophysical (sparker) data and retrieve vibrocores from the western shelf to date the end of the last glaciation. These proved hard to get as they targeted reworked gravels and diamictons which consist of very stiff mud, super compressed by the weight of the former ice sheet that once covered the continental shelf. However, successful cores up to 3 m long were collected on various sites. Fig. 3 shows the preparation phase of the vibrocorer before its deployment. The yellow and orange unit at the top is the vibrating electric engine that allows the corer to penetrate in relatively hard and coarse sediment. The last image shows the “core catcher”, a set of metal blades designed to allow the sediment to go inside the core but avoid it to escape during the recovery phase. The scientific team and the crew of the R.V. Celtic Explorer worked around the clock to get the best out of the good weather. Not even S.Patrick day could stop them as can be seen on figure below. 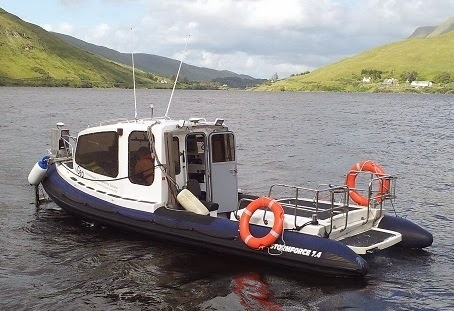 From 18th June to 21st July 2013, INFOMAR vessels operated by the Geological Survey of Ireland (GSI) carried out survey operations in Dingle Bay. 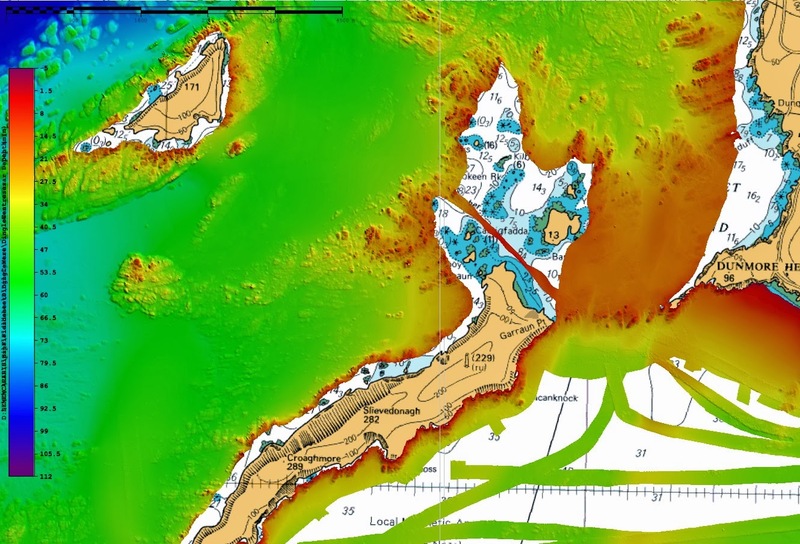 This seabed mapping extended multi-beam coverage that had previously been acquired by the Marine Institute (MI) in 2009. 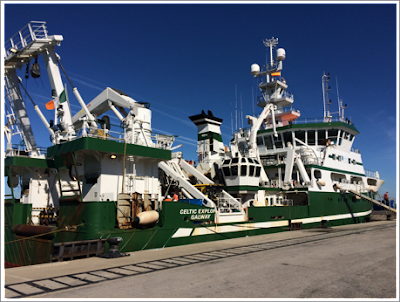 During that survey leg, the MI research vessel Celtic Voyager mapped the bulk of the deeper waters of the bay. The GSI vessels R.V. Keary, M.V. Cosantóir Bradán and R.V. 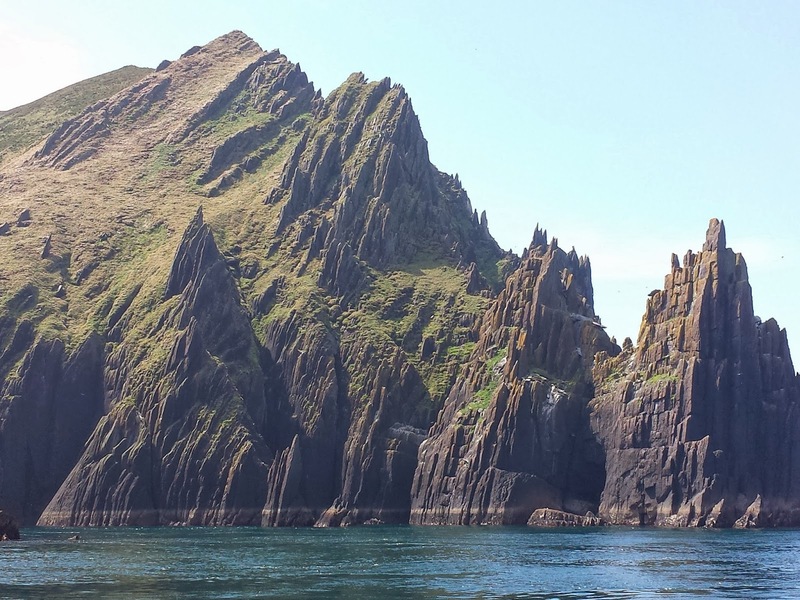 Geo finalised the seabed map by focusing their efforts on the shallower waters along the coast, along with surveying areas of seabed around the islands of Great Blasket, Inishnabro, Inishvickillane, Tearaght and Inishtooskert. The figure below shows the extent of each vessel's survey leg, including the 2009 leg operated by the R.V. Celtic Voyager. Click on the image to see a larger view. The legend displays colours for the following survey legs: KRY13_04 (R.V. Keary), CB13_03 (Cosantóir Bradán), GEO13_03 (R.V. Geo), CV09_02 (R.V. Celtic Voyager). 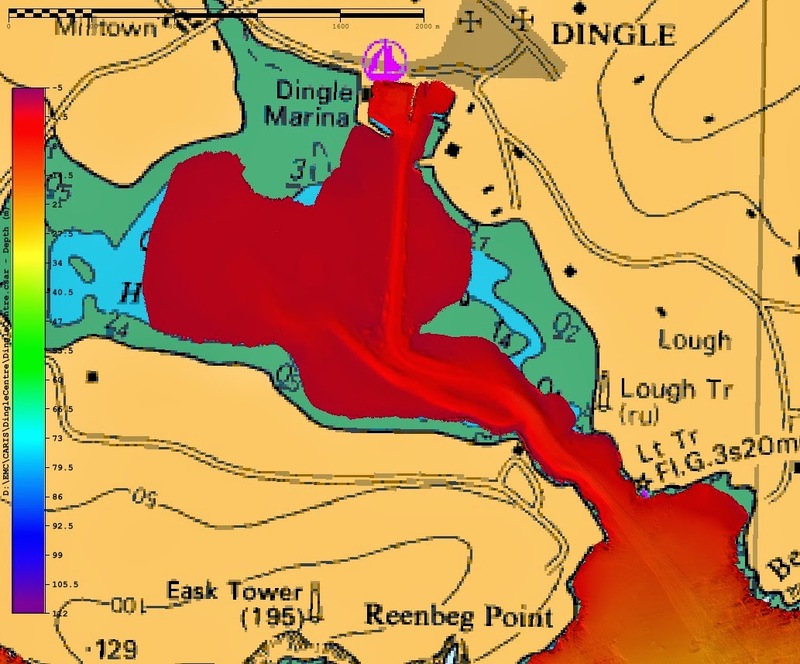 Below is a series of images detailing the bathymetric data (water depths) acquired during the 2013 Dingle Bay Survey. Note that this data is still in the process of being finalised and checked for errors and therefore contains some inaccurate depth information. The units of the colour scales are "metres below LAT" (Lowest Astronomical Tide) and are included to give an approximate impression of water depth. 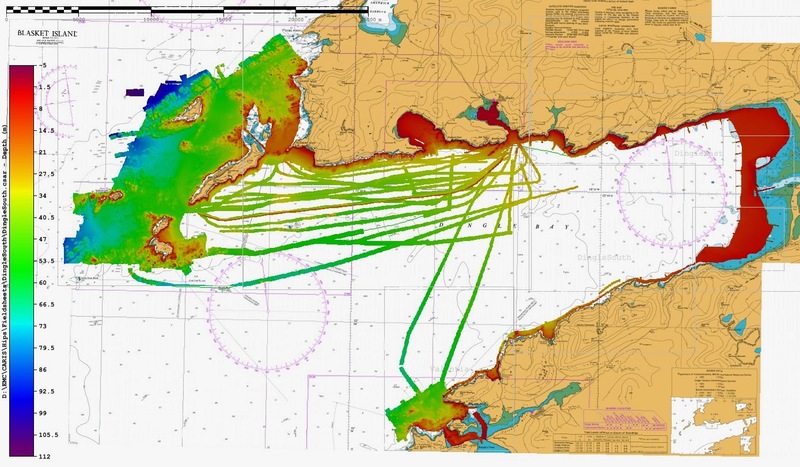 Several areas mapped were found not to agree with existing nautical charts - notifications of these hazards were sent to the United Kingdom Hydrographic Office for the purposes of chart corrections. 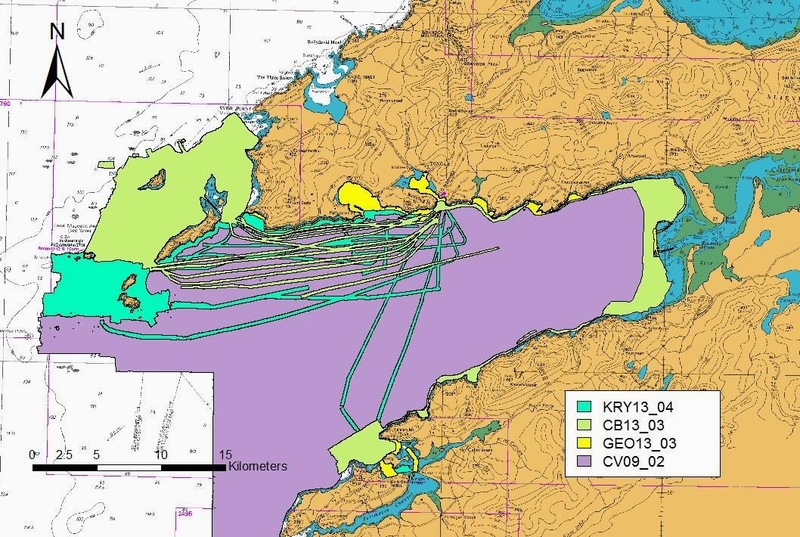 Note the survey lines crossing the middle of the bay - these were mapped while the vessels were in transit to and from their survey areas around the edges of the bay. This data can be compared with Celtic Voyager data in the same areas for the purposes of quality control. INFOMAR is a joint venture between the Geological Survey of Ireland and the Marine Institute and is the successor to the Irish National Seabed Survey.Covering some 125,000 km² of Irelands most productive and commercially valuable inshore waters, INFOMAR will produce integrated mapping products covering the physical, chemical and biological features of the seabed. 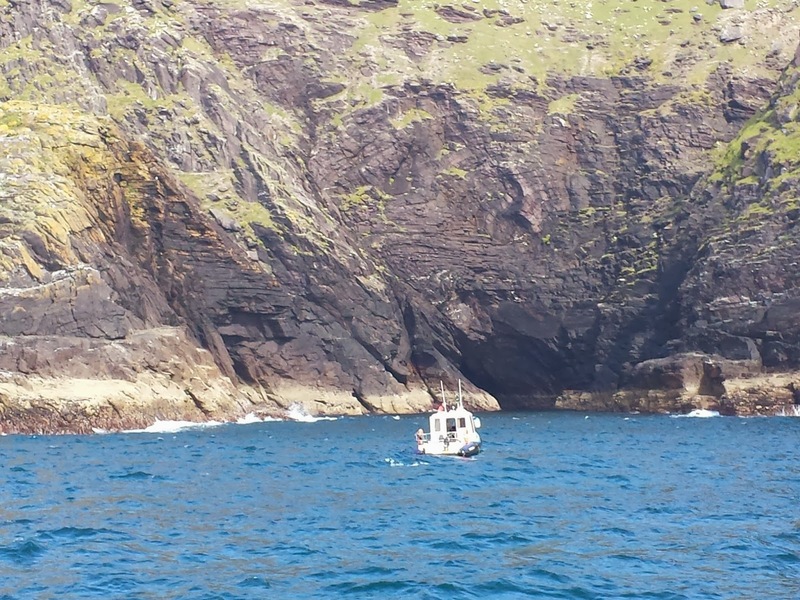 INFOMAR has prioritised the surveying of 26 bays and 3 prioity areas around the coast of Ireland.